For most of us, Market Yard in Pune is the go-to place for affordable exotic vegetables, a variety of flowers, spices, premium tea and coffee. But, did you know the place has many hidden gems that are beyond the obvious stops you make here? After exploring every nook-and-corner of Market Yard, we found 4 awesome places that we bet you didn’t know about. Located at Indira Nagar in Market Yard, Gultekdi, Ravi Store is almost like a two-storied mart for spices, pickles, chikki (a biscuit-like sweet made of peanuts and jaggery), papad, ketchup and instant mixes. If you’re a gourmet chef, this place will definitely make your life a tad easier. We particularly loved their pickles; from sweet and sour mango to spicy ginger, zesty lemon and tangy gooseberry, starting as low as INR 90. Market Yard is normally synonymous with vegetables, food, spices and dry fruits. So, to discover a charming little cafe in this area was quite the big deal. 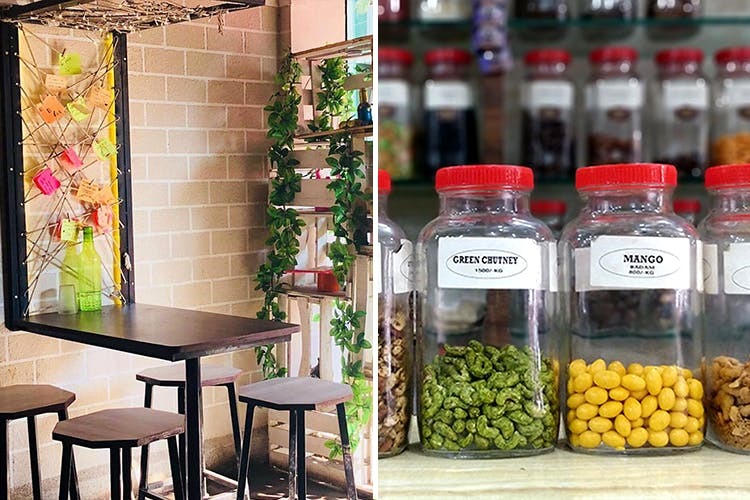 Started by two brothers, Anand Kocheta and Kunal Bagmar about a year ago, Coffee Stories is the quintessential Insta-worthy cafe with pretty leafy decor, cute hanging lights, romantic al fresco setup and more. Food-wise, we recommend you try their Arabiata penne pasta and mango margarita. For desserts, go for their decadent, melt-in-mouth sizzling-dizzling brownie. Vasudev Dryfruits at Duncan Road is a haven for dry fruits, chocolates, syrups, honey, squashes and jams. What makes this store unique is the fact that they sell dry fruits in the wackiest flavours imaginable – lychee, chilli guava, mint, Maggi, coffee, even panipuri! While the smaller nuts are priced at INR 1,200/kg, the slightly bigger ones start at INR 1,500/kg. We also recommend you check out their lip-smacking range of squashes and syrups – a perfect (and healthier) substitute for soda during summers. Tucked inside Adarsh Nagar Society in Market Yard, The Basil Deck is perhaps one of the finest multi-cuisine restaurants in the area. We particularly loved their paneer baloucha, made out of marinated baby corn and paneer and cooked in hot spices. Try this dish with makai methi pulao and dal Peshwari for a belly-filling luncheon. For desserts, we quite liked their lychee ki tehri which was basically a mildly sweet dessert made of lychee cooked in condensed milk and served in a kulhad. Needless to say, Market Yard is THE destination for various kinds of fruits, exotic vegetables and flowers at wholesale rates. You can definitely also check out the array of stores that sell dry fruits, spices, rice, tea and coffee at much cheaper rates than usual.